I have to tell you, honestly, that I wasn't sure I was going to review Scout . The truth of the matter is, I don't like it. The artwork holds no appeal whatsoever for me. And, as it arrived unsolicited, I thought I'd just as soon take a pass. But then. I opened the package which contained Scout in front of my children and they latched on to it. Not only that, but they requested a re-read. And then another. And then another. I asked my oldest (age 5 and 3/4) what it was that made him like this book so much and he said, "I like the black and red." I asked my middle child (age 3) what he liked about it and he said, "The dog." I didn't have to ask my youngest why she liked it. It has a dog. That is all that it needs to be a Caldecott winner in her book! Thus, I have resigned myself to reading about this black dog with a red ball. 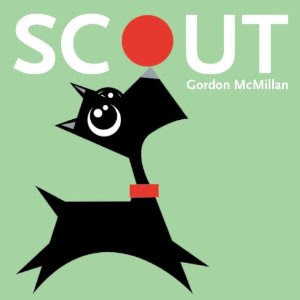 Scout is the story of a dog who wakes up from his nap to discover that his red ball is missing. He explores the apartment complex (very NYC) along with Cleo the cat, Frankie the Fish and Harvey the Hamster, looking for his treasured toy. They finally discover a gray mouse (with very triangular features) trying to whisk his ball away. The story is cute enough but it's the pictures that get me. All of the animals look very harsh in my opinion. Their sharp edges leave more to be desired. These pets, created by artist Gordon McMillan, do not make me want to cuddle them. I like the look of animals who look like they want to be cuddled. Nevertheless, the book remained on our coffee table where it remained the most requested re-read in the stack (until I moved it). When my mother came over to visit, apparently she was asked to read it to the kids. It was notable enough in her mind to mention that they had kept asking her to read Scout - the one "with the odd pictures." See? It's not just me. Seriously though, thanks to Sleeping Bear Press for shooting a copy of this one our way. My children thank you. Me? Well, perhaps not so much, but I'll live. P.S. The more I look at Scout's eyes, the more I see a little bit of cuteness. First (that they like that you don't) but not LAST, let me assure you -- ha!! Picture books are so subjective, because I saw the cover and thought it was super-cute. With picture books, I often find that my son likes them when I am so-so on it. The story sounds cute and original. I'm glad you reviewed it! I had to smile both at your review and Jennifer's comment. Yes, it definitely won't be the last time there will be a difference of opinion! The eyes are kind of cute. You asked about Cheddar's. It's a restaurant, but I'm hard pressed to describe what kind. They describe themselves as a "casual cafe." I like their ribs and several of their appetizers (and we don't usually get appetizers). In fact, I was thinking of going in there one day just to get their appetizer nachos for lunch. Artwork is a funny thing. My first reaction to Mo Willems' "Pigeon" books was that the art was hokey and primitive. But it grew on me, and I found myself loving all the emotional variety conveyed by the dark pencil lines. See, I liked the artwork because the eyes caught my attention right off! I always find it interesting how simple drawings that bear little resemblance to their original objects are still recognized by very small children. The human brain is amazing. Yeah, I have to admit, I kind of thought the picture there was pretty cute. I'm sure my little dog-loving boy would love it, too.